The words listed in this dictionary are related in the sense that the words have the same Japanese translation in English-Japanese and Japanese-English Translation Dictionary. The translations of the dictionary are extracted from the books having a Japanese (or English) edition. The authors include Stephen King, Kazuo Ishiguro, Lewis Carroll, Soseki Natsume, etc. This dictionary was originally edited by Yoichi YAMAOKA, a seasoned and well known English-Japanese translator. This dictionary might help you widen your way of thinking, or get a new insight into your writing. If you have some command of the Japanese language and want to see the Japanese origins of the translations, try Translation Thesaurus, also in this site. You can see the list of words in this dictionary. 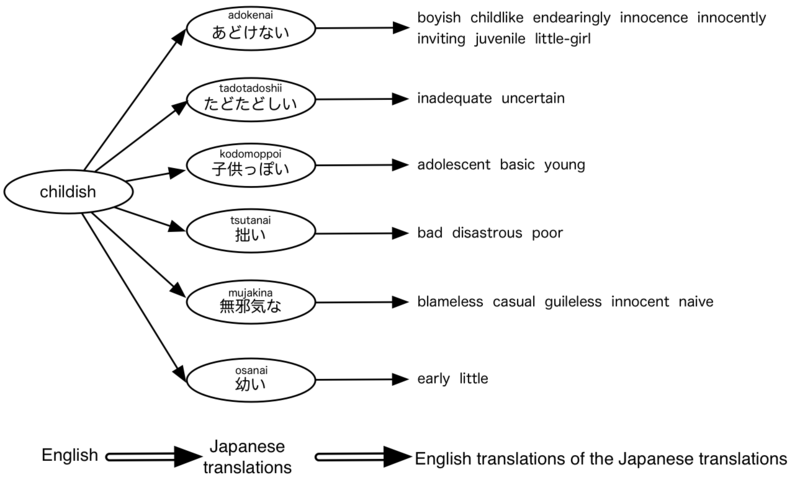 Depending on the context, "childish" could mean: childlike, poor, blameless, little, ..., and the corresponding Japanese are all different. You can see corresponding Japanese words at this page of Translation Thesaurus for Japanese-English and English-Japanese translators. You can see more examples by clicking Rand button at the top. DictJuggler.net is for translators, writers and editors. Copyright © 2009-2019 Marlin Arms Corporation. All rights reserved.